Gently slubbed Sea Glass is one our our most popular fabrics. Semi-sheer and softly textured, this easy care 100% Polyester fabric allows light in, yet provides a degree of privacy. The 12" band of smocking takes our Sea Glass Panels to a new level of sophistication. 3" rod pocket, no header. Use a 2 1/2" continental rod or a decorative rod may be used for a more contemporary look. 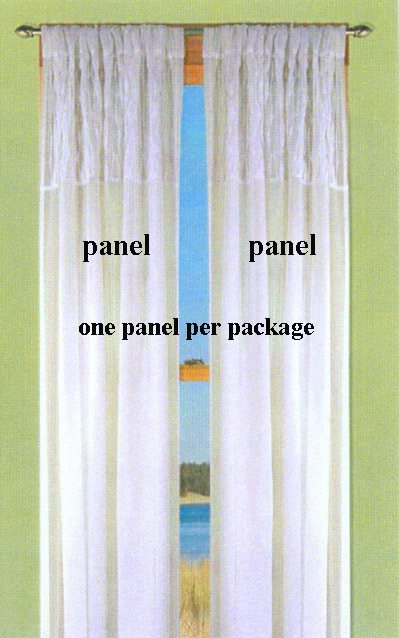 * Panel sold individually, one panel per package. Use two panels for a standard window. Machine wash gentle cycle cold water, tumble dry on low heat, low iron touch up. Panels are 54" wide and are offered in 3 lengths: 63", 84", and 96".